War online in New Russia (DPR and LPR), the latest news of ATO (anti-national terrorist operation) today. 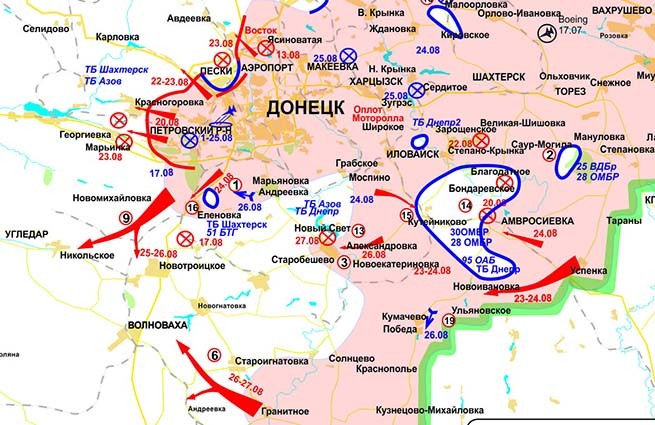 Operational reports from the zone of military conflict in the South-East of Ukraine. Fundraising for militia of Novorossia "Help Donbass"
8-55, militiaman, who miraculously escaped from captivity: "They wanted to get my tendons out to make me tell them all"
0-40, Posted by militiaman Prokhorov. "Reported - a tank reserve of Ukraine found - now the series from Krivoy Rog is coming - 47 cars with armored vehicles and 4 cars with personnel. Well, enough for a tank battalion. 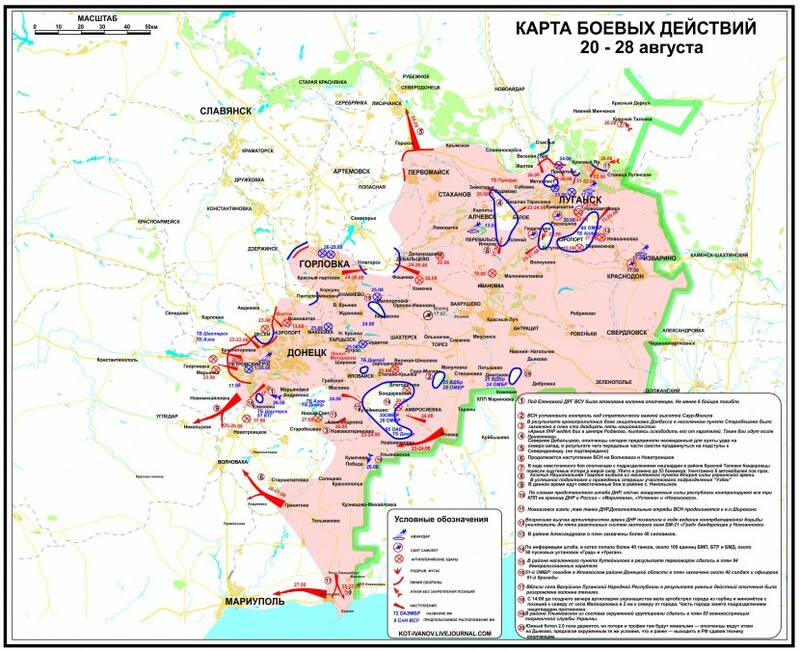 And then - they can go from Kamish-Zarya to Berdyansk-Mariupol or directly to Volnovakha . 0-00, "The militia cut Mariupol from the west, with the assistance of Zaporozhye partisans the militia came to the sea from the Zaporozhye region. With the appearance of the militia in the Zaporozhye region war for the liberation of the DPR and LPR turned into a war for the liberation of all of historic Novorossia. Yet at lunch everyone thought that the capture of Novoazovsk would be followed by frontal assault at Mariupol. Militia however did it more cunning: they have made in-depth coverage of the front of the enemy and now Mariupol, which over the past two days had been flooded by the last reserves of the junta, almost ended up in the pocket. " We are waiting for official comments from the staff. 23-30 Posted by militiaman Prokhorov. "In LPR an operation on elimination of the pocket launched - Aidar and AFU are completely knocked out of Novosvetlovka and Khryaschevatoye. BBC issued the-day-before-yesterday frames of AFU reinforcement arrival in Mariupol as snapshot of Russia invasion to Ukraine. Granitnoye village (to the west from Telmanovo). Abandoned positions of AFU (photos). " 23-10, commander of the AFU regiment surrendered to the soldiers of Novorossia . In the area of ​​the village of Ulyanovskoye (Amvrosievsky region) 61 punisher led by the regimental commander, Colonel S. Nakhotin, surrendered to the Ministry of Defense of DPR soldiers . 23-00, Brief Chronicle: - Army of Novorossia has been conducting all-out offensive on all fronts of DPR and LPR for already the second day. In the coming days Mariupol will be taken in complete pocket + be some more pockets will appear north. At this rate all Novorossia consisting of DPR and LPR would be soon perhaps liberated from Ukrainian occupiers and one can start to free Kharkiv, Dnipropetrovsk and Zaporizhzhya National Republics from the US-Banderite occupation . 21-15, 15 civilians killed during shelling in the afternoon in Donetsk. This was reported by the press service of the Donetsk City Council on Thursday, August 28. 20-50, militias claim that they took three settlements on the outskirts of Novoazovsk, in course of fights loss of Ukrainian army during Thursday has amounted to more than 200 people dead and wounded. We are talking about settlements Sedovo, Obryv, Kholodnoye, "Interfax" reports. It is noted that the territorial defense battalions "Vinnitsa" and "Khortytsya" "step back in the direction of Mariupol after the bombing and incurred losses in manpower and equipment." 3 tanks, two self-propelled artillery systems, various tracked and wheeled vehicles destroyed. 20-10, Posted by militiaman Prokhorov. "In Bezimyannoye (near Mariupol) it became hot". 19-12, DPR Defense Minister Vladimir Kononov (call sign "Tsar"), reported that in the last night about 250 Ukrainian soldiers have surrendered to the militia. 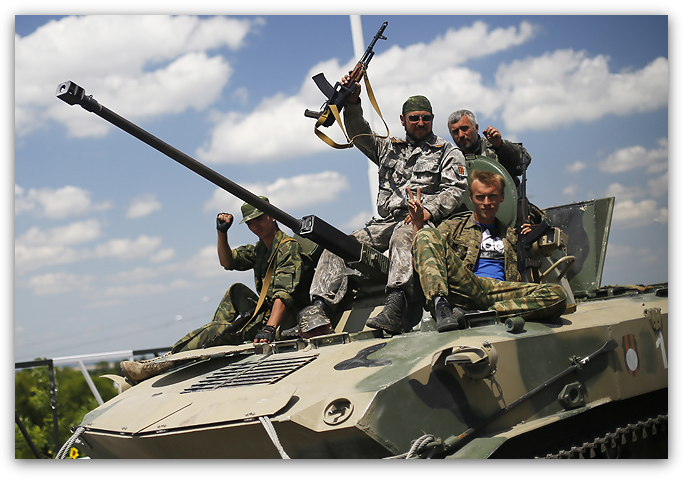 All of them are ready to cooperate with the authorities of the DPR, and some sounded a desire to go to war on the side of the militia. In addition, another fire spotter became a prisoner of the militia. Judging by the seized set of maps, she was preparing shelling of residential areas of the suburb of Donetsk. 18-35, In Donetsk shelling of the city center lasted more than an hour. Kiev district of the city suffered powerful blow, shells fell into the houses. Information about the victims of the shelling is not available on the moment. 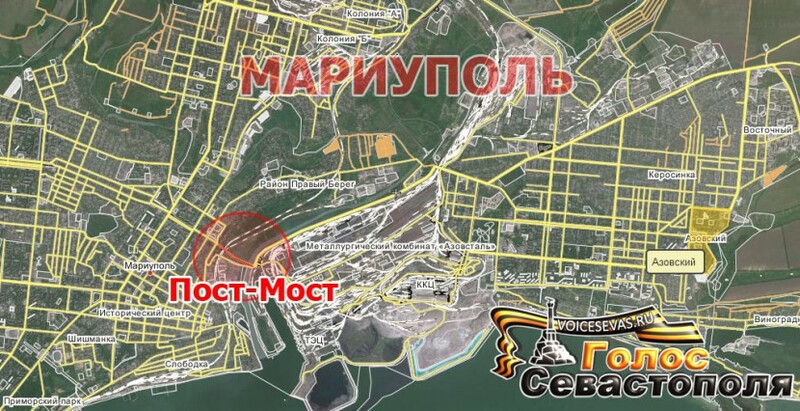 18-00, Mariupol is almost surrounded, the agency "New Russia" reports. According to them, for the last night militias have taken settlements Starchenkovo, ​​Respublica, Zeleny Yar, Boyevoye, Malinovka, Demjanovka, Starodubkovka, Chervonoe Pole, Osipenko, they have blocked section of the road on the district Mangush - Osipenko. In Urzuf there are battles. Chances are that today punishers will be locked permanently in Mariupol "pocket".
" There are no storms in Gorlovka, UA as always just shelled residential neighborhoods. Attacking at Yasinovataya is going on, but it seems that the attack has failed. According Debalcevo no info, but for now there are fightings in Avdeyevka. 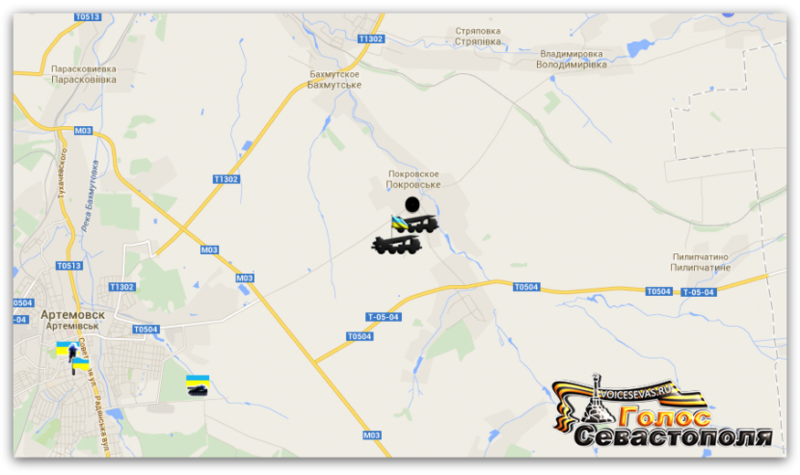 Regarding the reinforcement of UA in Avdeyevka and Debaltsevo - where is it? There is info that UA left the first public school for fear of attacks, and spread out around the city "
16-45, Posted by militiaman Prokhorov. "It is reported that there's a tank attack of UA at Yasinovataya. By the way, yesterday there was a report of someone from the comrades about the seizure by UA of Stanitsa-Luganskaya. Thank God - not confirmed. On the contrary - yesterday mortars have worked there nicely on terroristic battalion "Chernigov" and border guards." 16-35 Posted by Dmitry Steshin. "For already two hours some horrific gauges have been hitting the airport, at night a machine gun and other things shot near our house in greens - catching mortar saboteurs. The water hasn't been turned off yet, but the light in one area is off. As we knew - rushed to the charger, connected everything that was there to the outlet. " 16-30, "Soldiers of the LPR turned to the offensive at Lugansk. Clashes between militias and Ukrainian punishers go in the villages of Krasny Yar and Vergunka under Lugansk. Militias attack and move to the offensive, trying to push back the enemy from positions in these localities. At the direction of Lugansk there were fightings near the village of Faschevka. On the results of the fighting the information is not yet accurate. " 15-10, sources in the DPR army reported that the remains of a battalion tactical group (BTG) of the 28th separate mechanized brigade of AFU managed to escape with heavy losses from the pocket in the area of ​​village Starobeshevo, DPR. When going out the pocket BTG lost a lot of soldiers and almost all of their equipment. Moreover, the one of the divisions of about 17 people left in the encirclement. The defeated BTG steps aside to Melitopol for re-completing of personnel set. 13-15 There is a fire from the MLRS of the Tekstilshchikov district, AFU used cluster munitions again. 12-10, A Captive from Armed Forces of Ukraine: "Families of security forces soldiers threatened." Citizen of Ilovaysk Alexey Osipenko told that the authorities use military as "cannon fodder", and their families are threatened. 11-40, There are reports about mining of bridges in Mariupol. It is reported that in the "Post-Bridge" area and near another one bridge in the Iyichevck district strange activity of the Ukrainian military forces observed. Discharging some boxes and messing around piles. 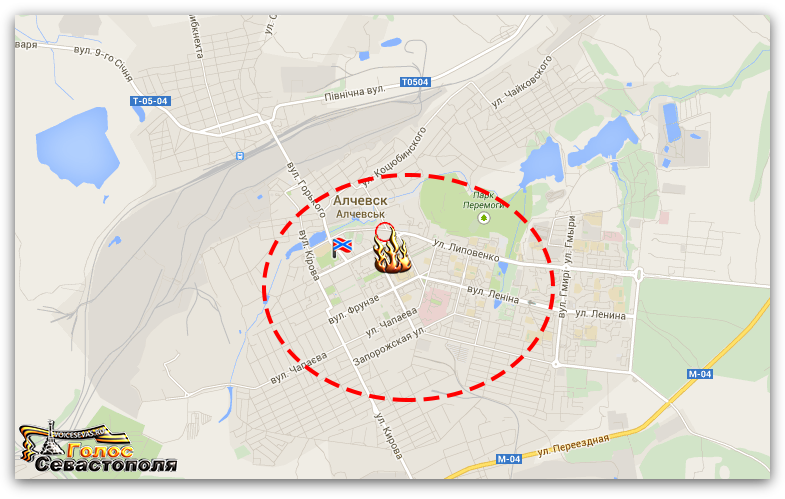 11-10, from locals: today at 5 am (local time) AFU bombed Alchevsk in the Novy District. 10-55, last night in the area of Starobeshevo (southeast of DPR) tactical missile "Tochka-U" fell, leaving a crater of six meters in depth. This is stated in the message of militia Staff. According to the defenders of the Donbass, Ukrainian troops had made ​​10 starts of tactical missile "Tochka-U" for yesterday, of which only two rockets reached the battlefield. "There are data on the field of movement of tactical systems, but is not yet known area of the start", - the report says.